Do yourself a big favor and take just a few minutes to check out a contractor on the BBB’s website. 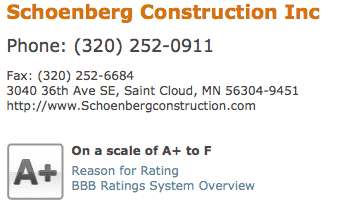 We have an A+ rating with the Better Business Bureau of MN/ND. If you want to learn more about our rating just click on the picture shown below. We have never had a single complaint filed against us in all of our years in business! But, sadly, in Minnesota (and North Dakota), complaints against general contractors rank #6 and construction and remodeling services rank #7. This means you have to BEWARE… because there are incompetent contractors out there, and LOTS of them. 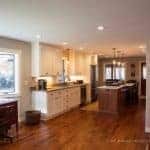 That’s why we highly suggest that you get informed BEFORE you hire a remodeling contractor, home builder, or home improvement company in central MN. Do you know the BBB of MN rating of your Contractor/Builder? Here’s and article to help you learn a bit more about the BBB complaints in MN/ND. The Better Business Bureau of Minnesota and North Dakota (BBB) has compiled the Top Ten industries for customer complaints and inquiries, according to their final statistics for 2011. For the year, the BBB provided 2.4 million total instances of service to the public, a new record. Complaints against auto dealers selling new cars topped our list last year, which could reflect the rebound the U.S. automobile industry is enjoying; more people buying new cars means the possibility for more complaints. However, the complaint resolution rate for that industry was an impressive 99%. Complaints against contractors were also prevalent, as evidenced by the five categories in the construction field which made the list. The construction industry also topped the list of inquiries from the public once again in 2011. The mission of the Better Business Bureau is to be the leader in building marketplace trust by promoting, through self-regulation, the highest standards of business ethics and conduct, and to instill confidence in responsible businesses through programs of education and action that inform, assist and protect the general public. Our hours of operation are 8 a.m. to 5 p.m. Monday through Friday. Contact the BBB at http://minnesota.bbb.org/ or 651-699-1111, toll-free at 1-800-646-6222. Visit the BBB’s Centennial website at bbbis100.org.